The tweet was written by Manisha Sinha, a professor of history at the University of Connecticut. Messages of support poured in immediately from Jelani Cobb, Annette Gordon-Reed, Kevin Kruse and scores of others. The ordeal began shortly after she wrote an op ed published by CNN with the headline, "What happened the last time a President chose America's enemies over its friends." In the article Sinha compared Donald Trump to Andrew Johnson. But within hours the discussion had turned potentially violent. The article had been published on Friday at 6:37 in the morning. 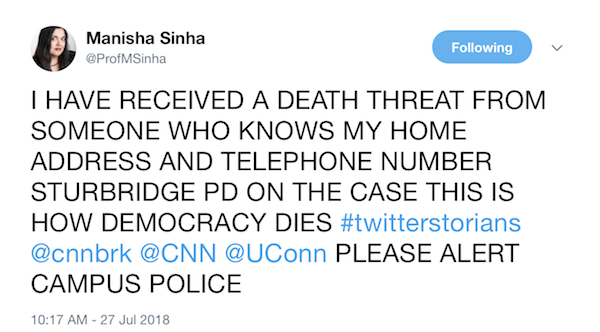 At 10:17 went out the tweet indicating she'd received death threats from someone who knew where she lived. In her tweet she asked followers to alert campus police. Sinha, the author of a new acclaimed study of abolitionism, The Slave's Cause: A History of Abolition, published this past February by Yale University Press, was unnerved. In a Facebook post composed the next day she related what had happened: "[J]ust after 9 am I received a series of threatening phone calls, vile, racist, and misogynistic. I thought I would just ignore them until the last one read out my home address and said they have it on GPS and would be coming to kill me. I called 911." She explained that she was so "freaked out" that when FedEx showed up to deliver a package she called the police. They arrived within minutes. The authorities' investigation quickly identified the culprit who'd made the GPS death threat call. It was from someone in Texas. He can now be prosecuted in Massachusetts. 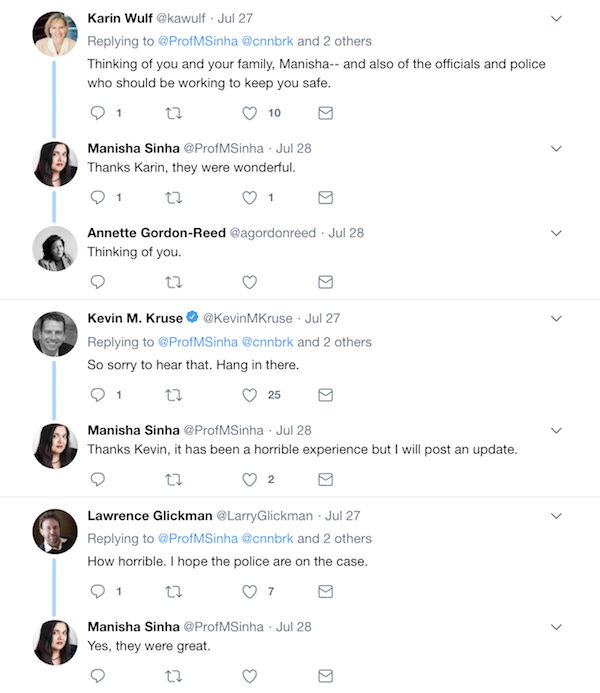 But Sinha, writing a little more than 24 hours after the threats had been made, remained frightened: "I want to thank everyone who worked so fast to track the phone calls but I have to say my peace of mind is gone." She won't stop speaking out, she said. But she also declined an invitation to go on Tucker Carlson's show on Fox News for fear of riling up his audience. She ended her Facebook post on an alarming note. "As an immigrant, naturalized citizen, I actually do love living in the United States despite the fact that I study the history of slavery and now of racial terror after the Civil War. I feel invested in the project of American democracy otherwise I would not write. That we now again live in an age where violent intimidation is becoming the norm is horrifying." Note: HNN published an interview with Sinha a few months ago. You can read it here.